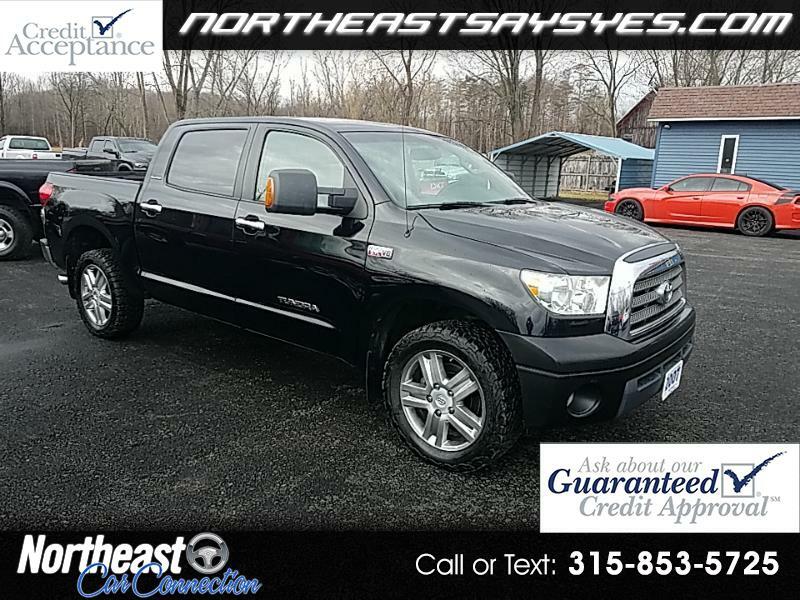 Up for sale this just in super nice and very clean 4 owner Carfax certified 2007 Toyota Tundra Crew Max 4x4... This one is the Limited edition, fully loaded including remote keyless entry, power windows,locks, tilt steering and cruise contro, factory CD , JBL uplevel sound system from the factory.... Dual powered heated leather front bucket seats with memory, 6 speen automatic transmission shifts perfectly, Toyotas mighty IForce 5.7 V8 gas engine that starts , runs and drives just as good as it looks...aluminum wheels with nice matching BFGoodrich all terrain radials all the way around..... Priced to sell well below retail value with extended warranties available from 6 mos to four years with unlimited mileage starting at 399 and up..... GUARANTEED CREDIT APPROVAL IS AVAIALBLE REGARDLESS OF YOUR CREDIT HISTORY WE CAN HELP.... FILL OUT A CREDIT APPLICATION ON OUR SECURE SITE AT NORTHEASTSAYSYES.COM OR GIVE US A CALL WITH ANY QUESTIONS OR CONCERNS AT 315-853-5725 THANK YOU FOR LOOKING..